Starting down the Cassiar, it seemed like everything was breaking down. We felt tired (even though we'd just taken a couple of days off at Watson Lake) and didn't seem like we were making the distance we expected. And it seemed like it was raining and cold every day. We were starting to get worried that we were going to "blow out" and get too discouraged to continue, as we've all seen happen with big tours before. 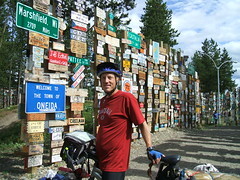 And then approaching Dease Lake in a horrible dirt-road section I broke a spoke in my rear wheel. We spent a day cleaning up and repairing and resupplying, and then spent a couple more days resting in Telegraph Creek. We had a VERY BAD MUD DAY right before we got to Dease Lake, and finally tried out a tip we'd heard before, and it worked great. We were able to get the bikes *really* working well again with a good cleaning. We're using the SRAM quick-connectors on the chain, so we just took opened the chain up using those. (Nancy has a Shimano chain, and the connector works on those, too.) If you didn't have that, you'd have to break the chain the old fashioned way. After removing the chains, we put them in a bit of diesel in a small peanut butter jar and shook and let it sit awhile. Finally, we let the chains dry just a bit, then applied some new lube. And the next day we put more lube on, because the diesel remaining in the chain dissolved a lot of the original lube, of course. Voila! The chains were as good as new! No more crunch crunch from the mud/sand. Maybe I won't be quite so unhappy in the future when we have a bad mud day, knowing that I really can clean it up right. We have had some really nice road and some excellent motorists. In fact, we'll look back on the Cassiar and Klondike and Dempster highways with fondness because the traffic was light and the riding good. But there are a few motorists whose Mama just didn't train them right. I'm sure *your* Mama taught you that when passing a cyclist or a pedestrian on a dirt road or in the rain that you should slow down so you don't slop all over them. And didn't your Mama teach you to give a cyclist a wide berth when passing... and if you can't pass safely right now, then slow down and wait until you can. Most of them are great, some some can use some more training! Watson Lake was a major construction staging area for the Alaska Highway back in 1942 and a lonely GI put up one sign pointing the way to his home town. Now there are more than 40,000 of them. Nancy got lost looking around at them and I didn't find her for hours. 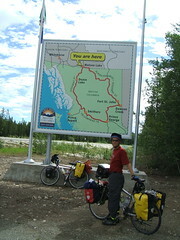 We've just ridden about 450 miles on the Alaska Highway and are about to turn south on the Cassiar Highway toward Dease Lake. Here's the map so you can all see where we're headed. We go on the left side of this down to Dease Lake (with a probable side trip to Telegraph Creek) and to Stewart and Hyde to see the bears eating salmon at Fish Creek..
We're leaving Whitehorse in the morning and will spend 5-7 days on the Alaska Highway getting to Watson Lake, where we'll resupply and then backtrack a few kilometers and head south on the Cassiar Highway. 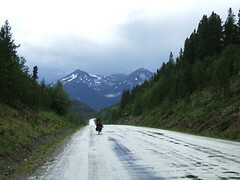 The Cassiar is a beautiful, little-travelled alternative to the Alaska Highway that runs south to near Prince Rupert. It's about 80% paved and about 500 miles long. Probably not much internet access :-) Many people report seeing lots of bears on this route (no trouble with them). And there's a famous trail at Stewart where you can watch the bears catching salmon - we might get to see that. We'll check in with you down the road! 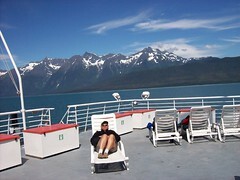 Here's Nancy pulling up the hill bravely to get to Juneau. See the tense muscles? Well, there's no way to get to Juneau on a bike except to get on the ferry. Aw, shucks. It was hard, bad weather and everything. It was a glorious day, blue skies, amazing mountains. And a welcome rest.